Surrounded on all sides by farmland sits a small, disadvantaged community of 10 housing units in California’s Salinas Valley. The primarily Spanish-speaking residents are agricultural laborers who work the fields of what is commonly known as “America’s Salad Bowl” due to the large quantity of crops grown here. These individuals provide their state and country with the fresh produce we expect at our local grocery store, but they do not have access to clean drinking water or even water clean enough to bathe or cook. Like all of us, they desire access to safe water for themselves and their children. But they lack the financial resources to hire the engineering expertise to evaluate their options for clean water. Jennifer Wisniewsk (left) and Dina Nabutovsky (right) gather data to evaluate water quality in the Salinas Valley. The problem stems from location. The community is too far away from the city of Soledad to be connected to the city’s water main, so they must source their water from a well located adjacent to fields steeped in fertilizers with high nitrate concentrations. Rain and irrigation runoff cause the nitrates to seep into the ground water. As a result, the community drinks, cooks and bathes in water dangerously high in nitrates — well over the Maximum Contaminate Level (MCL) set by the EPA for drinking water quality. 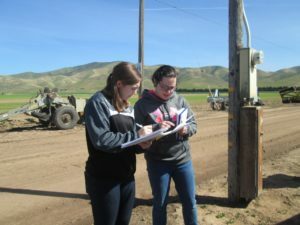 An EWB-USA CSU project team recently returned from an assessment trip to the Salinas Valley community over spring break. The students, alongside their faculty advisor, conducted water testing at the wellhead and the water tank that distributes water directly to homes, and gathered the data necessary to evaluate solutions for the community’s water problem. EWB-USA CSU is currently analyzing the options available to the community to obtain clean, safe water. The chapter is looking at three primary solutions: 1) consolidation (tie-in to the city’s water main); 2) drilling a new well; and 3) wellhead treatment. When their research is complete, the chapter will provide the community with a report outlining the advantages and disadvantages of each potential solution as well as an economic analysis of the alternatives. The ultimate goal is for the Salinas Valley community to use the report to access grant funding for the final design and construction of the preferred solution. For several of the EWB-USA CSU students, the assessment trip to California’s Salinas Valley was the first time they witnessed firsthand the stark disparity that can exist between communities in the U.S. Their experience speaks to the heart of the Community Engineering Corps — it is not necessary to travel outside our country’s borders to engineer change. Underserved communities throughout the U.S. now have an engineering partner to help meet their infrastructure needs and improve their quality of life. 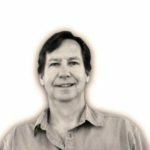 Peter Waugh is the Community Engineering Corps Director and Principal Engineer at EWB-USA. Peter has 30 years of experience in water resources, structural engineering and civil engineering. He served in the Peace Corps for two years in the Republic of Seychelles and has worked on EWB-USA projects in Mexico, Guatemala, Honduras and Uganda.